For throwback Thursday, I’m going way back to Halloween 2016 and one of my stockpiled Marley Spoon reviews. 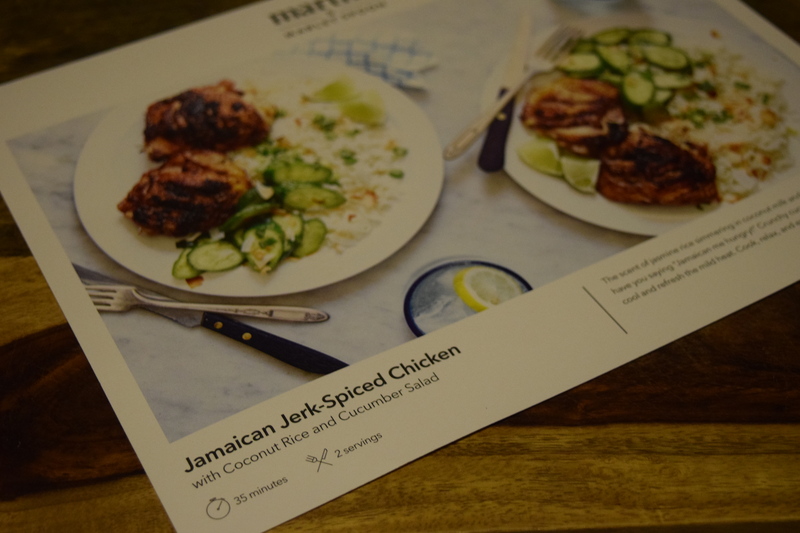 If you’d like to try out this weekly meal subscription service for yourself, use the coupon code COOKSMART for $30 off. They labeled it “spooktacular!”, so how could I resist? 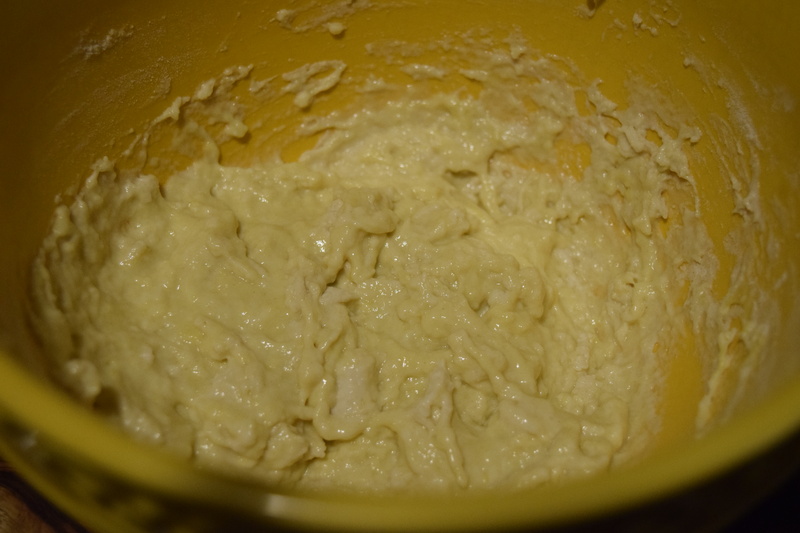 We start with making our spaetzle dough. Now there was just one itty bitty problem. I hate caraway seeds. Hate them so, so much. They are the reason I don’t care for sausage and everything bagels. I’m leaving them out. If you like them, just pretend my spaetzle is filled with little death pods, er seeds. Next we get to chopping. At this point I was supposed to dissolve a beef broth packet with water, but alas there is no beef broth packet included. Luckily I have chicken broth in my pantry so I use that instead. 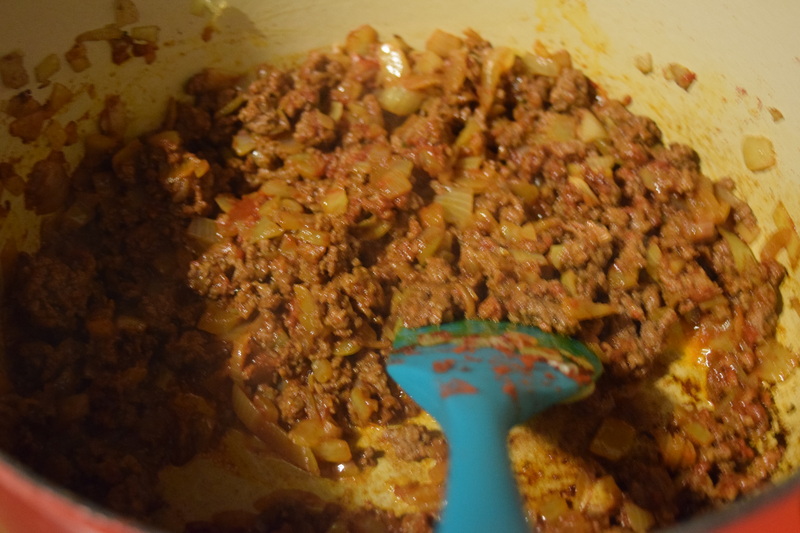 Next we cook the onion and ground beef until brown, and then stir in tomato paste and paprika. 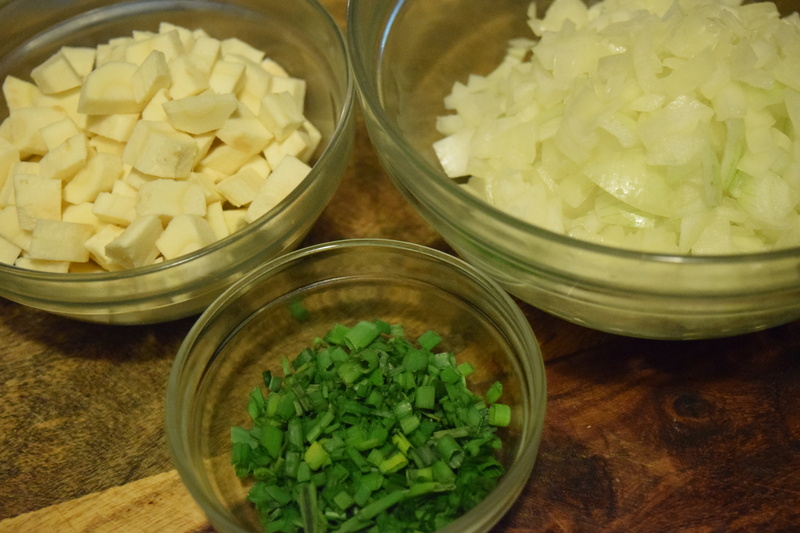 We add in the parsnips, beef broth, salt, and pepper, then cover and cook until the parsnips are tender. 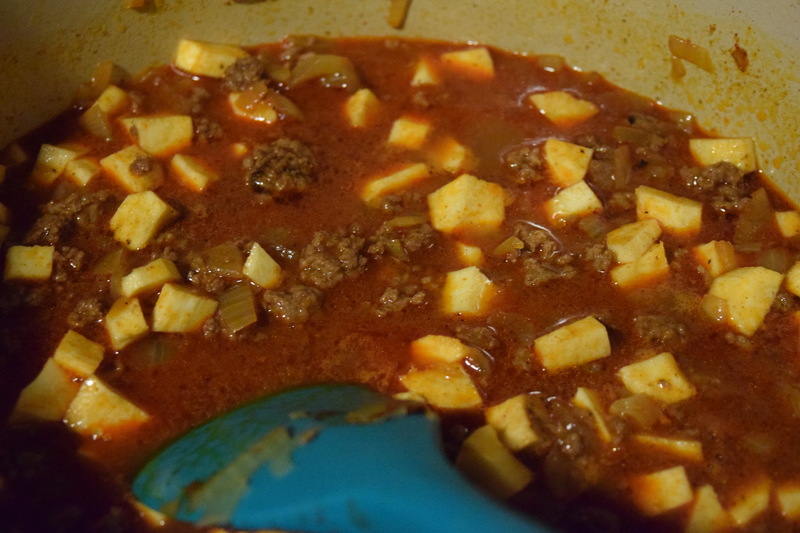 We remove the lids and then cook until thickened. Now the tough part. 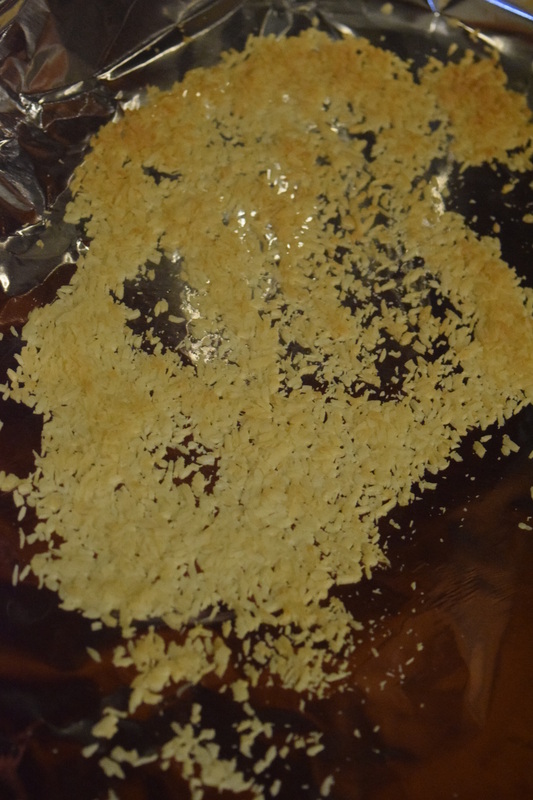 We’re supposed to spread the spaetzli dough on to a cutting board over a pot and then scrape it into boiling water. This dough is sticky and I can’t express how stressful this was for me. 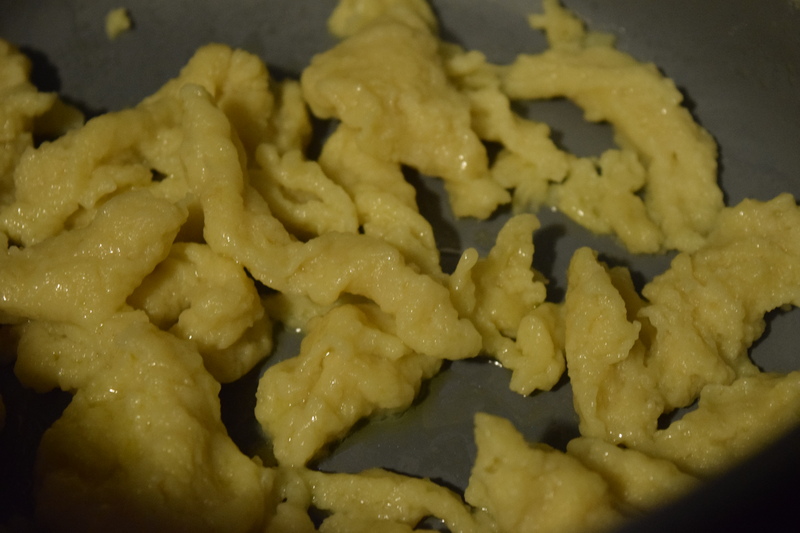 In the end my spaetzle was really sad looking. It gets tossed with some oil, and then divided between two plates. This dish had a lovely flavor, and despite the ugliness of my spaetzle, it tasted excellent. 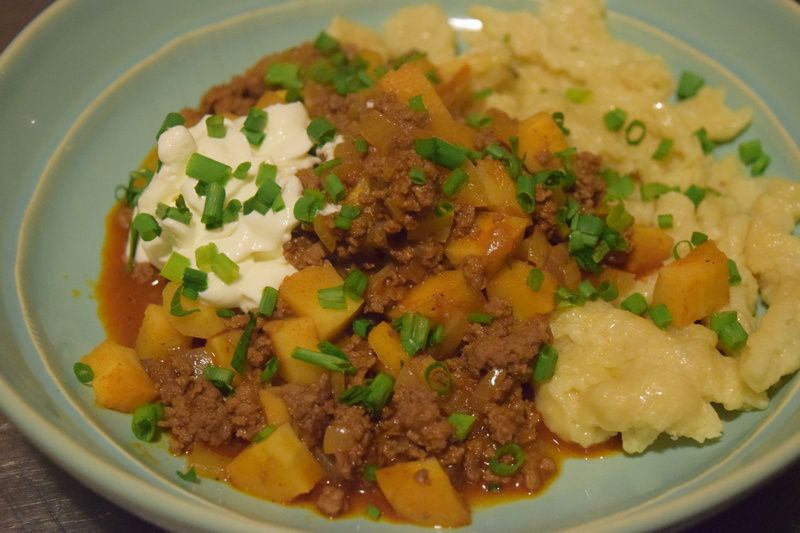 The recipe is just a bit fussy for a weeknight with multiple bowls and pots, plus getting the spaetzle right was tricky (at least for me). 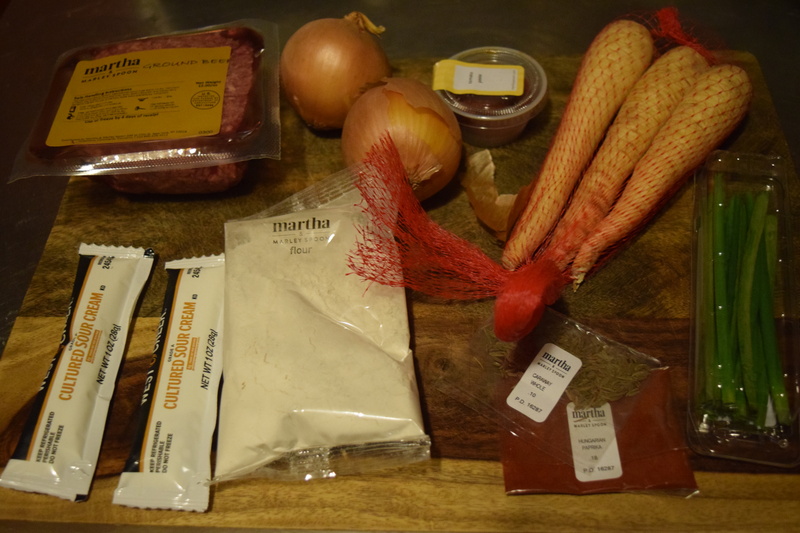 I was also missing the beef broth packet, so that detracted from the recipe. 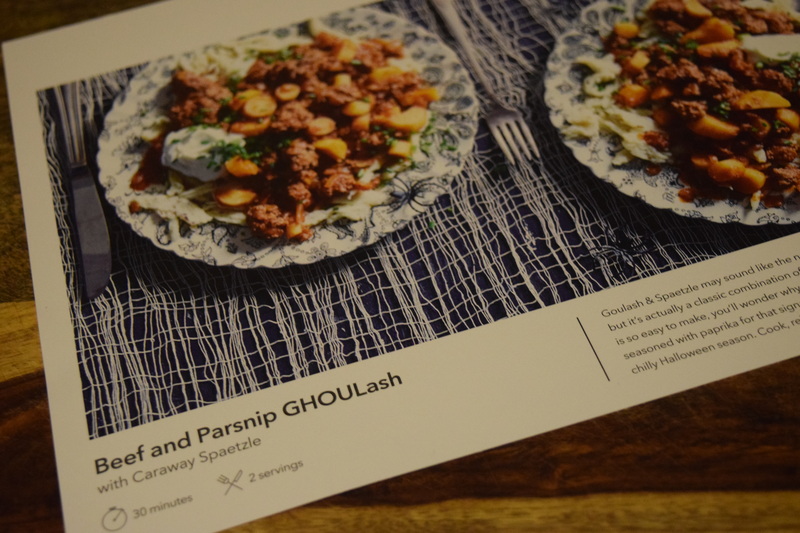 I’m not sure if this was “spooktacular” enough but it was hearty and the parsnips paired very well with the beef and paprika. Good for Entertaining? : No. It’s a bit too homely a recipe and the spaetzle is just way too stressful to get right. 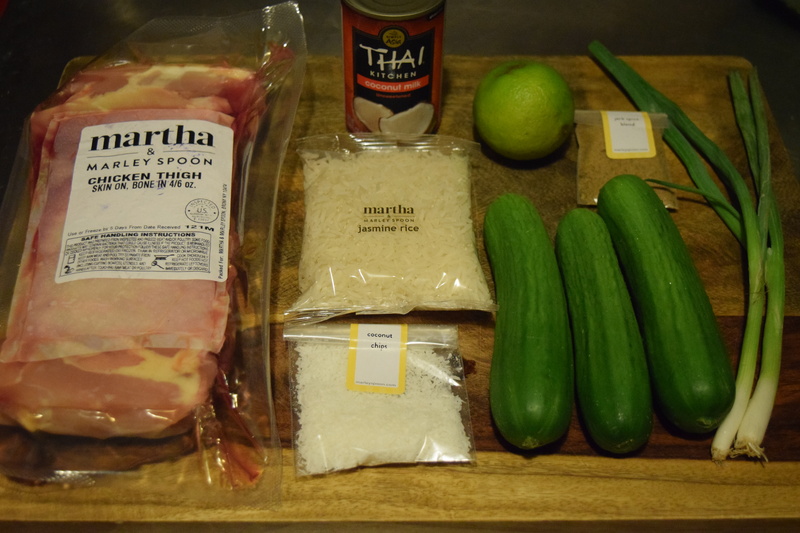 I can never say no to Jerk Spices and Coconut. 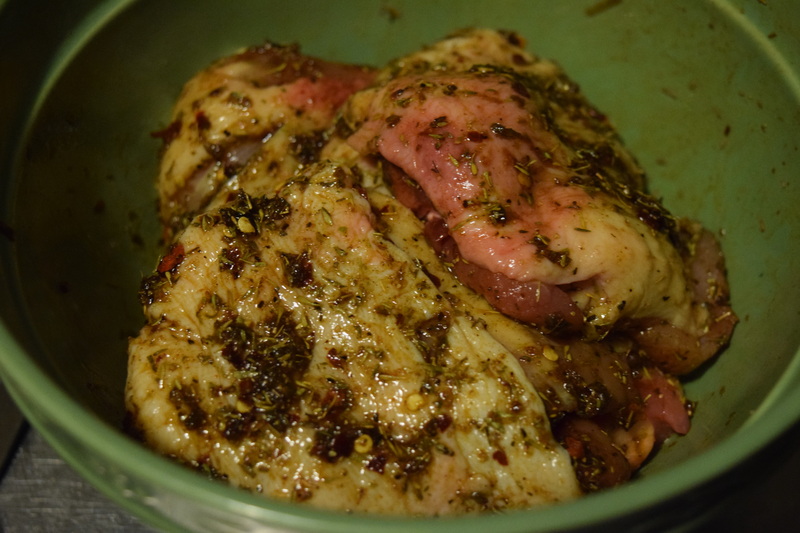 We do some slicing and zesting, then marinate our chicken in lime zest, oil and salt. 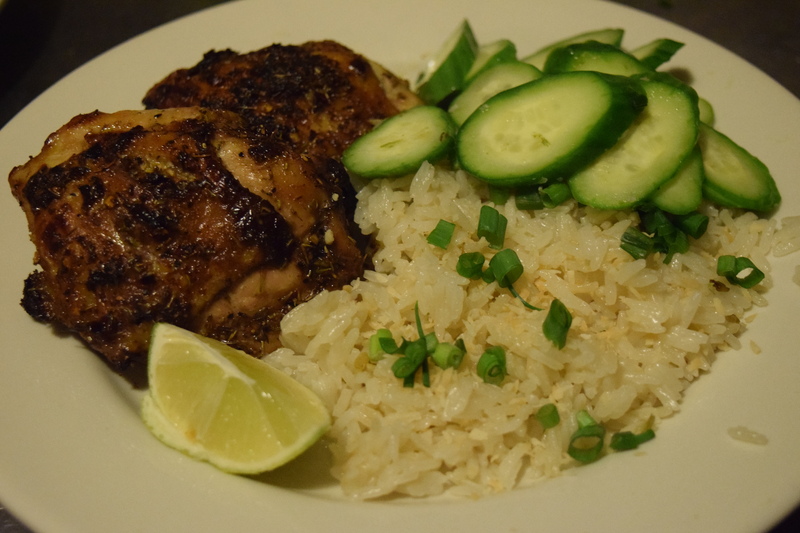 The chicken gets cooked while we make rice with scallion whites, coconut milk and water. 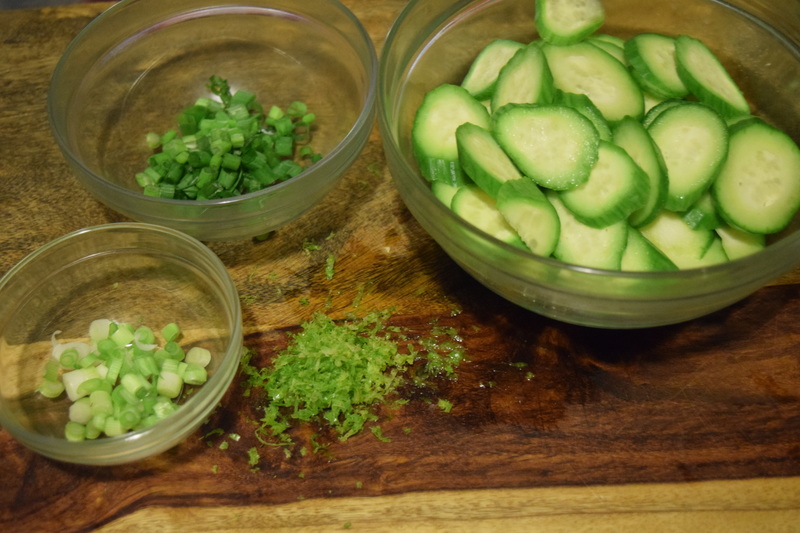 Thinly sliced cucumbers turn into a salad with the remaining lime zest ½ the scallion greens and a bit of salt and lime juice. We toast some coconut and then plate our ingredients. The chicken had a nice flavor and I loved the coconut rice. 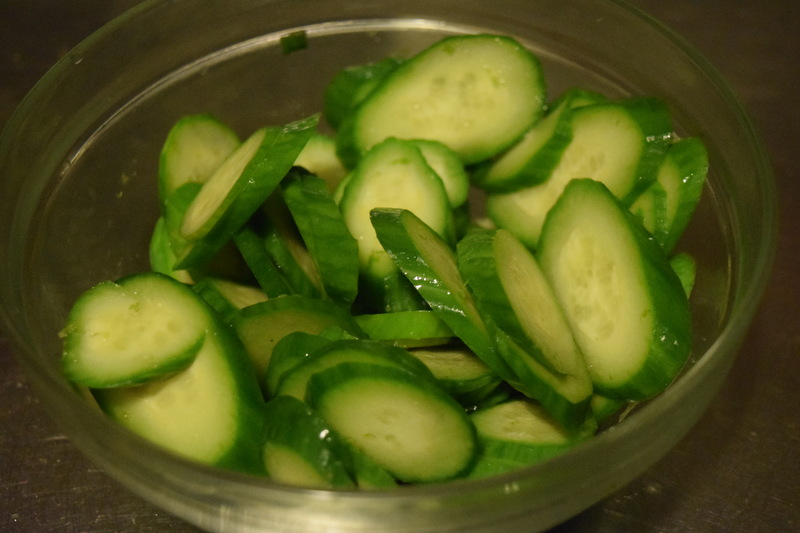 The cucumbers were refreshing and this dish didn’t require extensive prep or a lot of clean-up. It was well balanced and worked nicely for a weeknight. Good for Entertaining? : With some tweaking. 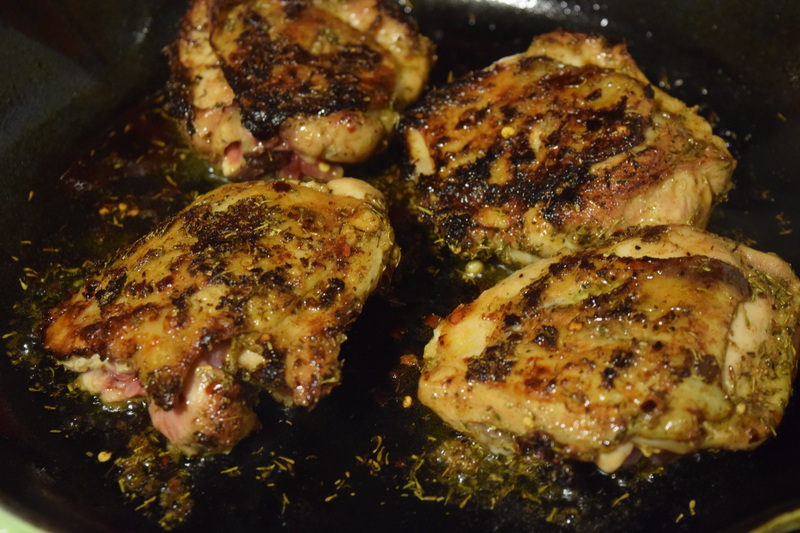 I’d turn the bone-in chicken thighs, into boneless jerk spiced kabobs and do everything family style. For drinks I’d serve pitchers of pina coladas and mint iced tea. I’d add on another main dish of Thai Mango Salad with Shrimp. Appetizers would feature an Asian inspired dip, like this Thai Peanut Hummus served alongside tortilla and veggie chips, and some beef curry puffs. Dessert would include a tropical fruit salad and a light, fluffy Coconut Cake. I thought both dishes tasted great and had interesting elements. The only real downsides were the missing broth packet and the challenging spaetzle. Without those two issues, this box would have been a “love”. I’ve been on a break from Marley Spoon for the last two months because I’m in the process of moving and renovation, but I’ve still got one review left to finish up. Once I’ve got my new kitchen up and running, I’ll be trying out some new Marley Spoon boxes as well as some other food subs.